The lovely guys at Essence contacted me again to see if I would like to take part in their new blogger challenge, Beat The January Blues! I said yes and look at the little package they sent me. 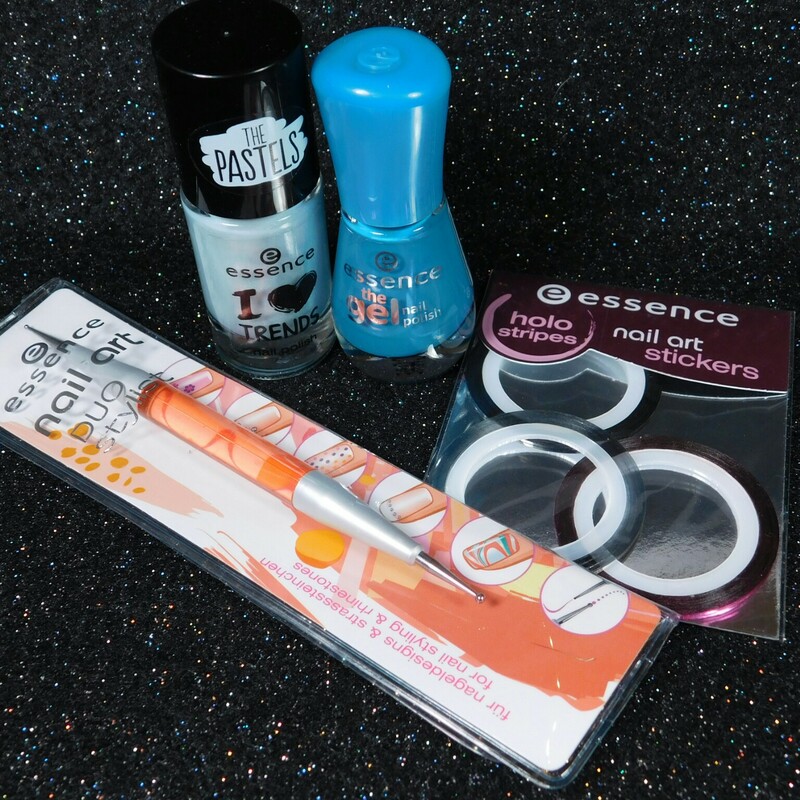 Two lovely blue polishes, a dotting tool and some holographic striping tape. So I thought I would show you swatches of these polishes as they are both gorgeous, especially Let's Get Lost, which is right up my street. In fact it's pretty similar to the feature wall we have just painted in our living room! 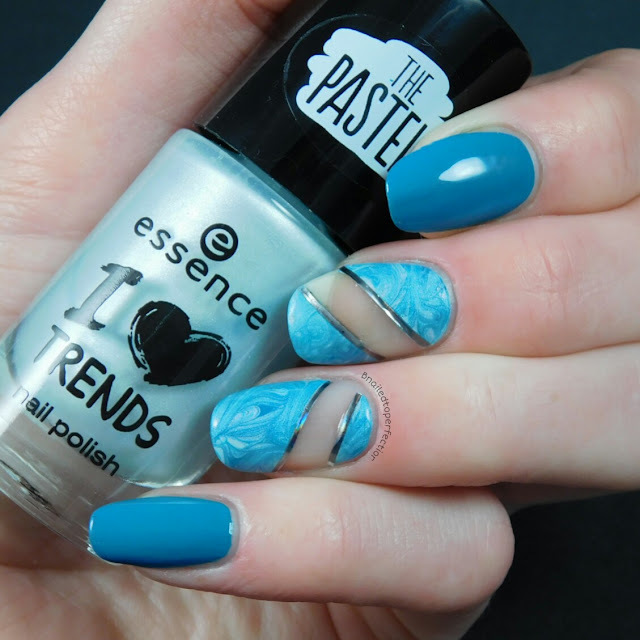 Love this bright blue teal and it was opaque in just two coats. I have a lot of love for the brushes from the gel collection. They make application so effortless. No top coat applied for this swatch. I had a bit of a love/hate thing going on with Bubble Bath. It is a lovely very pale pastel blue but I'm not keen on the finish, which I would describe as chalky. Some people may love it and it would appear different with a top coat of course. 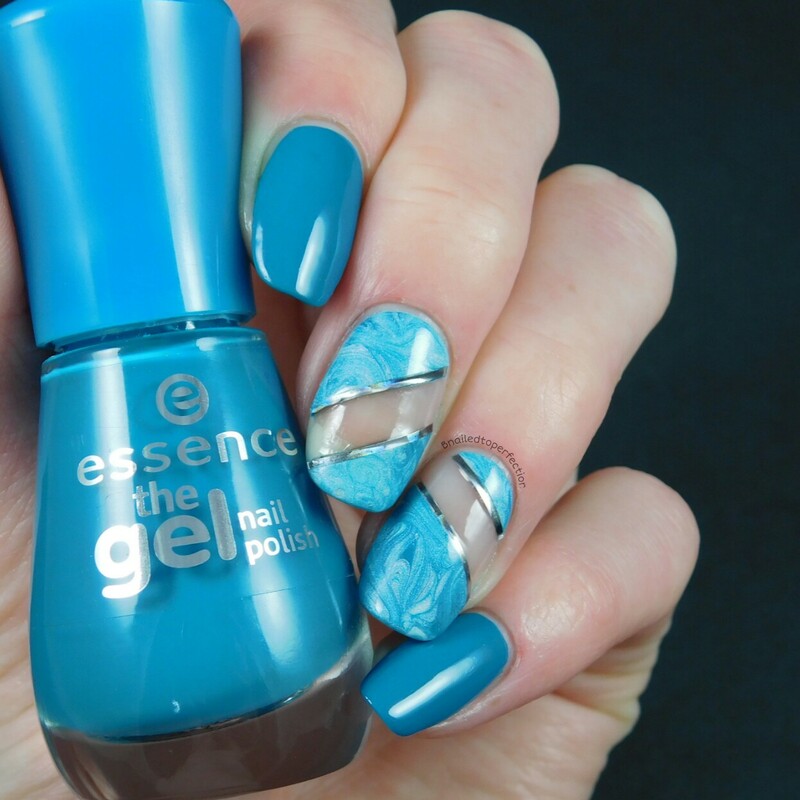 The nail art look I created was inspired by this design from the amazing Sveta. I'm sure most of you that love nail art will have heard of her but if not click here to educate yourself :) she is a fantastic nail artist! Back to the nail look...I created decals on my mat by swirling the two colours together with the dotting tool to create a marble effect. After I left the decals to dry, I cut them up and applied them to my nail as above and outlined them with the striping tape. I used Let's Get Lost on my pointer and pinky. 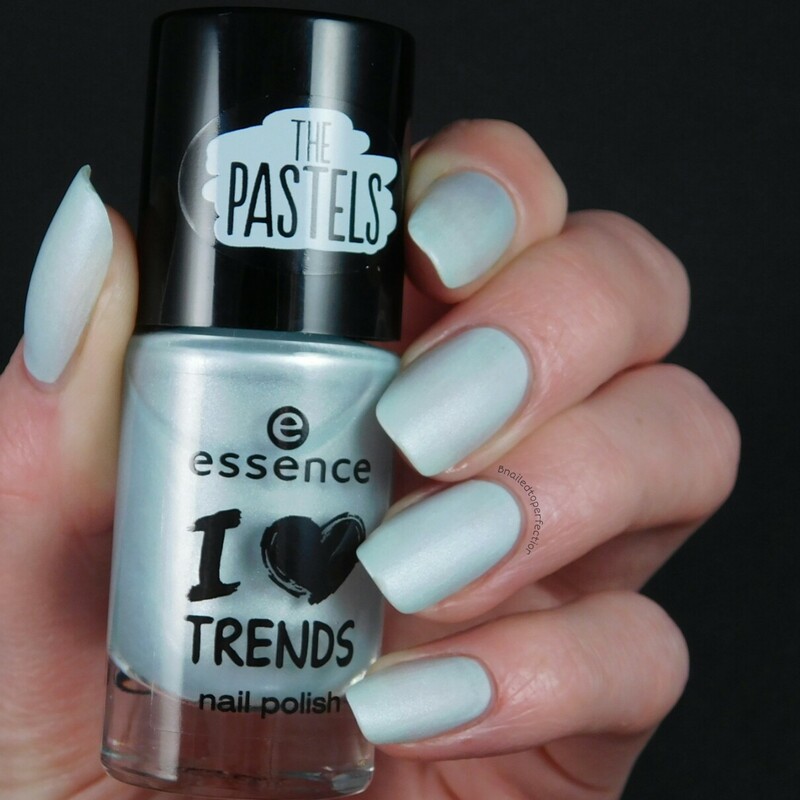 What do you think of the nail art look I re-created? 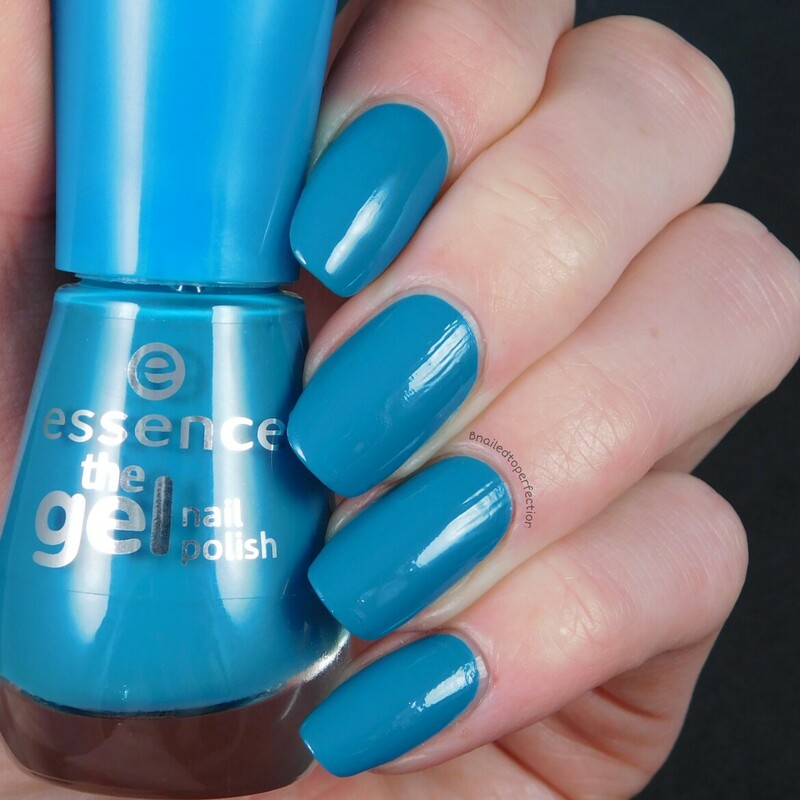 You can pick Essence up from your local Wilkos at really good prices!